Bicycle: The History Herlihy, David V.
New Orleans will forever exist in a post-Hurricane Katrina context. 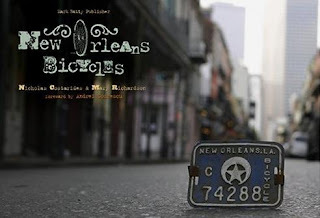 New Orleans' Bicycles features over 100 colorful and detailed photographs taken eighteen months prior to the disaster. Thought some of the bikes look as if they would crumble under the weight of a rider, and others have the carefully considered accouterments of an art object, every bike in the book was used on a daily basis. These photographs, and the accompanying text that lyrically meditates on the significance of the images, show the side of New Orleans that most visitors never saw. It is the power of these bikes scattered throughout the decaying landscape of New Orleans that attracted the authors to shoot these photographs. Naturally, the photographs depict how things were given the time they were taken. It is impossible to predict what the future will bring for New Orleans, and New Orleans' Bicycles does not claim to address how the city has changed. What it creates, however, is nostalgia for how the city was prior to the hurricane, and hope for those ways to return. A portion of the proceeds from sales will go to a New Orleans community bike project.